I'm posting this because everyone loves Apple products and they rarely have discounts. 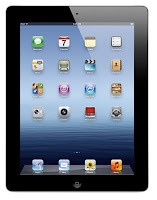 Today eBay is offering a brand-new Apple iPad 3 3rd Generation Tablet for $500. That's $200 OFF the retail price and includes FREE shipping. The next best deal I can find online is $60 more. It comes with a 2048x1536 resolution (4x the amount in the iPad 2). Trust me, videos on this are better than on your HDTV. Speaking of which, you can stream movies from the device to your HDTV wirelessly. Thousands of apps, take rich photos or videos, surf the web, shop online... you know what it can do. I use it for car rides - I'll watch Magnum P.I. while the girlfriend drives. I feel like a prince! Click here to view the offer at eBay.